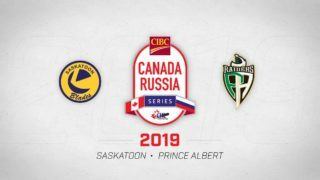 Saskatoon, SK – The Saskatoon Blades are heading into the final weekend of the pre-season and the battle for the backup goalie position is still on. 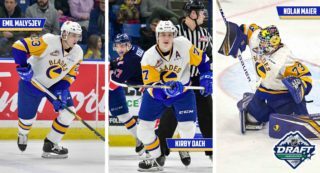 Joel Grzybowski and Nolan Maier have given Blades’ management a selection headache, with both tenders staking their claim for the job of serving behind the 20 year old veteran starter Logan Flodell. 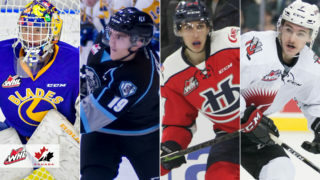 It is irregular for a 16 year old goalie to play in the WHL but Maier has battled against the odds and impressed the right people to earn an extended look this season. He was drafted by the Saskatoon Blades in the 2nd round, #25 overall in the 2016 WHL Bantam draft. In the 2015-16 Saskatchewan Bantam AA Hockey League season he recorded a league best goals against average of 1.54 and followed it up in the 2016-17 Saskatchewan Midget AAA Hockey League season where he finished with a healthy .920 save %. 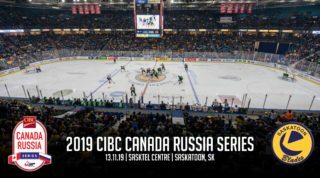 Maier also had a strong showing at Hockey Canada’s U17 summer development camp, and has yet to find out if he will don the maple leaf at the U17 World Championships in November. Maier has made two starts this pre-season, recording one win and one loss while also splitting a third game in a loss shared with his counterpart, Joel Grzybowski. Across those appearances, he has earned a .894 SVS% while posting a 3.48 GAA. The 18 year old Grzybowski, who looked shaky at times during training camp, erased any doubt making 27 saves for the win in his pre-season debut against Swift Current. Some have speculated it’s Grzybowki’s position to lose, however he insists that is not the case and like everyone in the system he has to earn his spot on the roster. Grzybowski was drafted in round 11, #223 overall by the Blades in the 2014 WHL Bantam draft. Last season he played in the Saskatoon Junior Hockey League and posted an excellent 1.66 GAA and a .935 SVS%. His performance earned him a position on the SJHL’s ‘All-Rookie Team.’ This preseason has seen Grzybowski start one match and split another with Maier, posting a .900 SVS% and a 3.05 GAA. 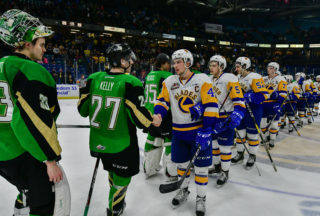 The Blades have one last game on the pre-season schedule this Saturday when they travel to Edmonton to take on the Oil Kings at 7:00pm in the downtown community arena. Fans can catch the action live on the official voice of the Blades, 92.9 The Bull FM. Pre-game show with Les Lazaruk begins at 6:30pm.